My card for today combines a few challenges. 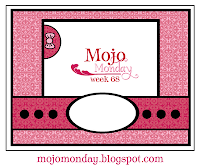 First, I finally got to play with Julee's Mojo Monday #68 (see right). Isn't it a fun one?! 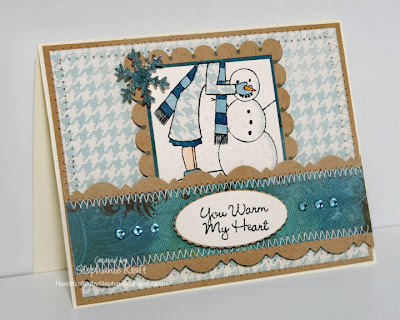 Secondly, I added the OCC color challenge to use two shades of blue and a neutral color. Finally, I tried to play along with Cindy's What's Up Wednesday (WUW) monochromatic challenge (though I think I have a little too much Kraft thrown in to make it qualify as monochromatic). Accessories: Square and Petite Ovals Nestabilities (Spellbinders), swiss dots embossing folder and Cuttlebug (Provo Craft), cornice border punch (Martha Stewart), snowflake punch (Marvy), markers (Copic), rhinestones (Kaiser Craft), diamond dust glitter, foam tape, thread, sewing machine.